At the time, people tell you it’s going to be OK, that it’s going to be better. But you can’t hear it. Deep down, you know it’s true but you can’t find it in you to believe. It’s been almost two years since my dad died. And yes, it’s true. It’s been OK. Everything is fine. It hasn’t always been easy, but I’ve focused on that light on the horizon and headed straight for it and I’m there. And you know what? It’s more than OK.
We’re at a point where we can reminisce about Dad and laugh and celebrate what he has left us. We can recount stories he’s told us and chuckle about his iconic ways. We’re carrying on with our lives, knowing that this is exactly what he would’ve wanted. One thing I couldn’t anticipate is how our 11 year old would process and adjust to his grandfather’s death. He’s turned out to be a resilient old soul and he’s internalized the essence of his Goong Goong. He ruminates about Dad’s stories and lives by his principles. Lately, he’s been talking about things Dad used to cook for him. He recalls dishes with gusto and surprisingly, he describes ingredients and methods, one of which is this pan-fried chicken. I had no idea that Dad made this for him, nor had I any idea that the boy watched and learned and now remembers. It’s curious what makes things OK. This is one of them. If you don’t have a cast iron pan, you can still make this: brown the chicken in a heavy skillet, then transfer to a baking pan to cook through in the oven. In a small bowl, combine salt, paprika, thyme, oregano, marjoram, garlic and onion powders and pepper. 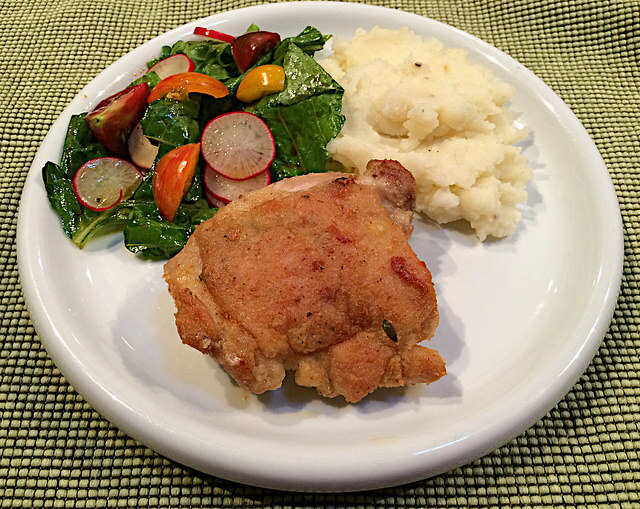 Season chicken thighs (get under the skin!) with about half of the seasoning. Place the flour in a shallow dish like a pie plate and stir in the remaining seasoning. Lightly coat the chicken thighs in the flour mixture. If you like crunchier chicken, coat the chicken, let sit for a few minutes then coat again before frying. Heat a cast iron pan over medium-high heat. Add cooking fat so it just coats the bottom of the pan, then add another good glug or dollop. Place the chicken thighs skin side down and let brown, 5 to 7 minutes. Move the thighs around a bit so they brown evenly. Turn thighs over and brown, another 5 to 7 minutes. Carefully transfer pan into oven and bake for 10 to 15 minutes or until thighs are cooked through.